I am taking a walk along the path where history interacts with geography and words rub shoulders with images – the vintage postcard path. The destination doesn’t matter and the route is determined by the random selection of old postcards I have bought at an antique fair. 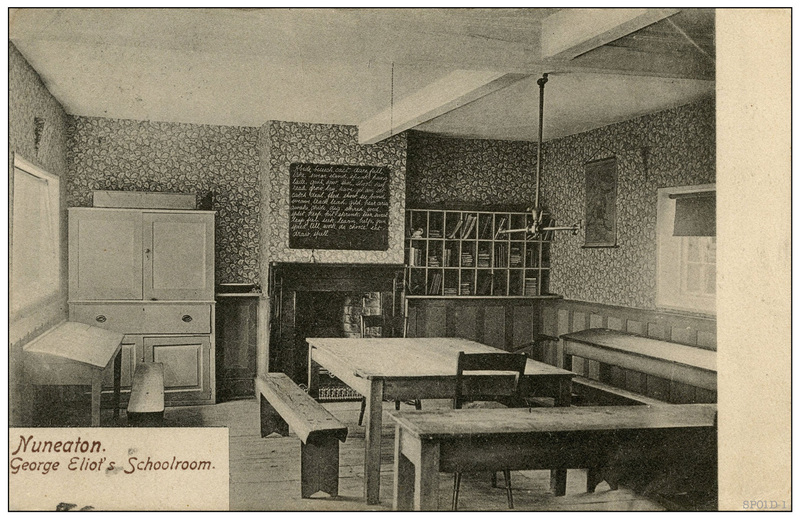 Number 11 in the series sees us in the schoolroom of a famous 19th century author. George Eliot was full of contradictions: a woman using the name of a man, a pillar of the Victorian establishment who lived a life of a bohemian, a girl from the provinces who lived life in the big city. It was a contradiction of my own that first came to mind when I picked this particular postcard from the pile I have accumulated over recent months – for here is an name I know so well but I don’t think I have actually read any of her books. That is a contradiction I need to put right in the near future, but for the moment I want to concentrate on the connectivity of time. George Eliot was born in 1819 and her relatively short life came to an end in December 1880. So when this postcard was sent in 1905, Eliot had only been dead some 25 years and would be more in the realms of a recent celebrity rather than a historical icon. 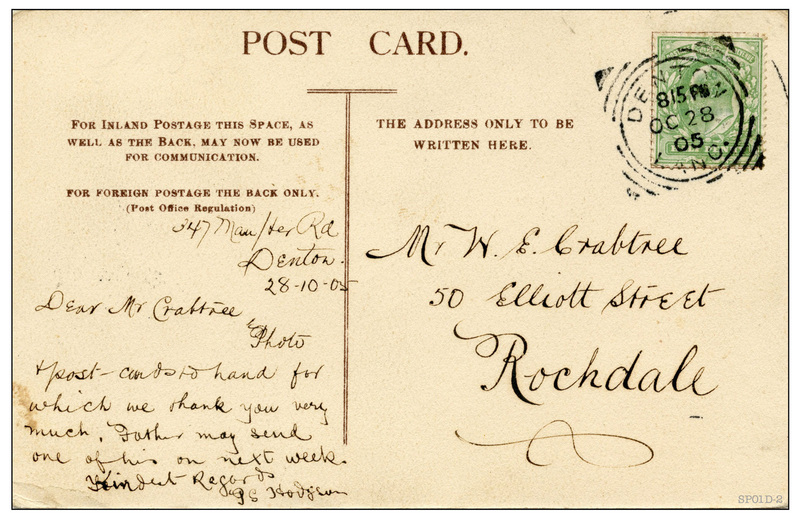 The card was sent to William Edward Crabtree of Elliott Street (different spelling, different Elliott) in Rochdale who, at the time, was a 25 year old architectural assistant. The glorious connectivity of time means that Crabtree was born whilst George Eliot was still alive. The card was sent by Gertrude Hodgson of Denton near Manchester who at the time was a 13 year old girl. It would be nice – in a George Eliot kind of way – to be able to tell you that Gertrude grew up and fell in love with the handsome architect, but alas, that is not the case (she went on to marry a builder called Harrison). William Crabtree married a girl called Fanny and lived in the Rochdale area until his death in 1963. In 1963 I was myself a 15 year old, living just the other side of the Pennines in Halifax – less than 25 miles away from Elliott Street as the Ted Hughesian crow flies. So there you have it: a crumpled old postcard linking me to George Eliot. It is amazing where you end up once you take a walk along the Vintage Postcard Path.